The remarkable story of President Harry Truman's first four months in office when this unlikely, small-town, Washington outsider had to take on Germany, Japan, Stalin and the atomic bomb, with the fate of the world hanging in the balance - one of the most extraordinary challenges in American presidential history.Heroes are often defined as ordinary characters who find themselves facing extraordinary circumstances and, through courage and a dash of luck, cement their place in history. Chosen as President Roosevelt's fourth term Vice President for his admired work ethic, good judgement and lack of enemies, Harry S. Truman was the prototypical ordinary man from small-town America. That is, until he was thrust in over his head following the sudden death of Roosevelt. With the world still caught up in the inferno of the Second World War, Truman found himself playing the roles of both judge and jury during the founding of the UN, the Potsdam Conference, the Manhattan Project, the German surrender, the liberation of the Nazi concentration camps and the decision to drop the Bomb and bring the war to the end. 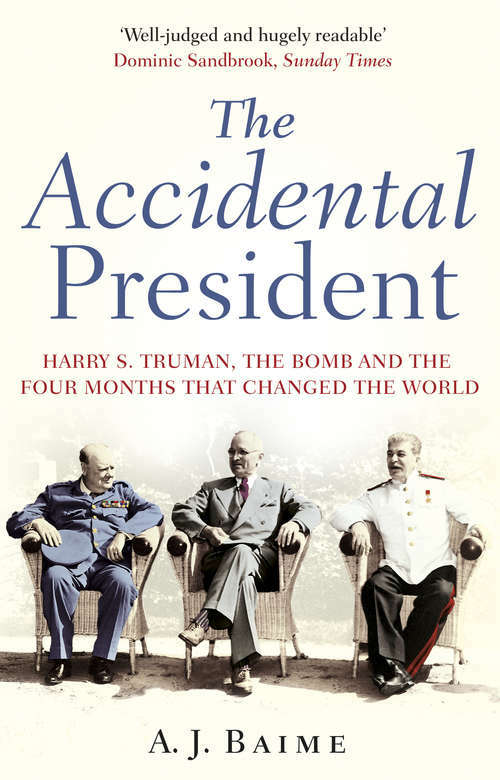 Tightly focused, meticulously researched and drawing on documentation not available to previous biographers, The Accidental President escorts readers into the situation room with Truman during this tumultuous, history-making four months - when the stakes were high and the challenges even higher . . .